(CNN) - Cyclone Idai has swept through Southern Africa, potentially killing hundreds of people and leaving widespread flooding in Mozambique. Aid workers are also racing against time to save thousands of children from becoming trapped in Buzi, a district in the country's central Sofala province that could become submerged in the next 24 hours, according to an aerial survey, the international charity said. "Thousands of children lived in areas completely engulfed by water. In many places, no roofs or treetops are even visible above the floods. In other areas, people are clinging to rooftops desperately waiting to be rescued," said Machiel Pouw, Save the Children's response leader in Mozambique. The European Union has announced it would send $3.97 million in emergency aid to Mozambique, Malawi and Zimbabwe. The United Arab Emirates has said it would send nearly $5 million in aid. The aid consists of food supplies and food supplements for children, medical and medicinal supplies, as well as shelter supplies to assist 600,000 people across the countries, according to the Emirates Red Crescent. 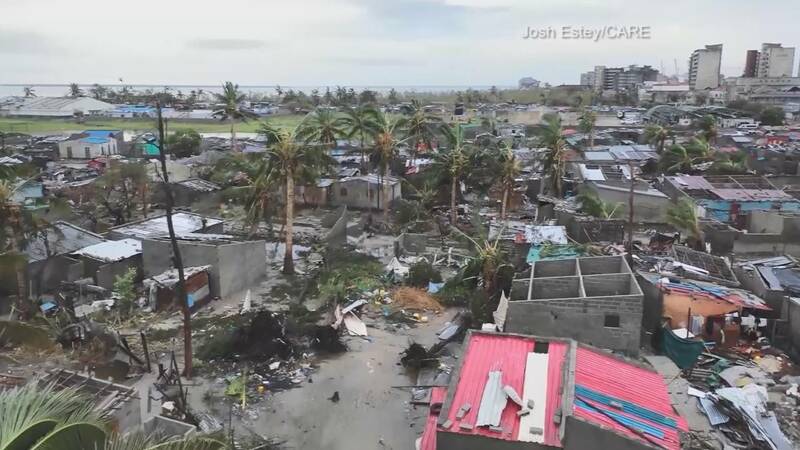 Fears are growing for more than 500,000 people in the Mozambique city of Beira, after aid agency officials warned that 90% of the area had been destroyed by Cyclone Idai. "The roads are totally cut, so Beira is isolated and cell phone network is down," said Marco Tamburro, program director for the nonprofit Humanity and Inclusion. Thousands of families, many from the poorest areas of Beira, have lost their homes. While some have found shelter with neighbors and friends, he said, most have no other option than to wait for humanitarian aid. Tamburro has also warned the flooding could lead to a disease outbreak. "It is a big risk having this big quantity of water in the city, there's a risk of an outbreak of cholera, malaria and other diseases." The first images from the EU's Sentinel-1 satellite show that an area of 150 square miles (388 square kilometers) was affected, the EU's Copernicus Emergency Management Service said on Tuesday. That's an area more than twice the size of the District of Columbia. Residents in Beira told AFP many victims were injured by the flying metal sheets from the roofs of some houses in the area. "Flying sheets of metal decapitated people. People are very bad here, some are in hospital ... we don't have any help here ... it's getting bad, we're eating badly, we're sleeping badly and we don't have homes," Rajino Paulino said. Layla George, another victim, said she was sleeping on Thursday night when the roof of her house was blown away by powerful winds caused by the cyclone. "I was inside my house, I was sleeping and I had set the bed for my daughter to sleep underneath ... suddenly the roof flew away. I had locked the door and I lost the keys. We started crying for help but there was no help because it was the middle of the night and there was a lot of wind," George told AFP. The residents said they have lost their houses and they have no place to stay. More than 200 people in Mozambique have been confirmed dead, Mozambique President Filipe Nyusi told journalists on Tuesday. He cautioned that number was preliminary. On Monday, when the death toll stood at 84, Nyusi said his government was expecting it to rise to more than 1,000. Nyusi described seeing "bodies floating" in the water after two rivers broke their banks "wiping out entire villages" and isolating others. "It's a real humanitarian disaster of large proportions," said Nyusi. If Nyusi's estimated death toll is confirmed, Tropical Cyclone Idai would be the deadliest tropical cyclone on record to have hit southern Africa. Medecins Sans Frontieres, or MSF, said there was no power in Beira and surrounding areas, and nearly all communication lines had been destroyed. "Main roads leading into Beira have been cut off, buildings have been submerged and severely damaged, and all business has been shut down," said the aid agency, adding that "medical activities in Beira hospital, in local health centers, and throughout the community have ceased completely." Though the cyclone hit Mozambique on Thursday, the extent of the damage has taken days to come into focus due in part to the country's poor infrastructure. Amnesty International in a statement on Tuesday called on foreign governments and international aid agencies to "ramp up" resources and assistance for thousands of people who have been displaced, and those who are trapped in the aftermath of the disaster. The international human rights organization urged authorities in Mozambique and Zimbabwe, countries that are prone to flooding, to adopt climate change policies that could reduce the impact of such occurrences. "As the effects of climate change intensify, these extreme weather conditions can be expected to revisit us more frequently. The devastation wrought by Cyclone Idai is yet another wake-up call for the world to put in place ambitious climate change mitigation measures," said Muleya Mwananyanda, Amnesty deputy regional director for southern Africa. The situation in Beira, a low-lying port city on the Indian Ocean, was described by the International Federation of Red Cross and Red Crescent Societies, or IFRC, as terrible after an aerial assessment conducted by the agency Monday. IFRC spokesman Jamie LeSueur said up to 90% of the area had been destroyed. "The scale of devastation is enormous," said LeSueur. On Sunday, a dam burst, cutting off the last road to the city, which aid workers are now struggling to reach. A former Portuguese colony, Mozambique gained independence in 1975 and suffered a 16-year civil war that ended in 1992. Today, despite recent economic growth, about half the population remains below the poverty line. Cylone Idai has caused destruction on such a large scale because of that poverty and lack of infrastructure. Tropical cyclones are known to hit Mozambique in the fall. In February 2000, Cyclone Eline also made landfall near Beira during a period of intense rain, killing hundreds and displacing 650,000 across the wider region. After making landfall in Mozambique, Idai moved through neighboring Zimbabwe and parts of Malawi as a tropical storm. In Malawi, 56 have died and nearly 600 are injured, according to MSF. On Twitter, Zimbabwe's Ministry of Information said Monday that 98 people had been confirmed dead. Hundreds more had been reported missing, while another 102 were injured and 42 marooned. The information has not been verified by CNN. Zimbabwe President Emmerson Mnangagwa has made a disaster declaration for affected areas, the ministry said. Idai triggered floods in Zimbabwe that swept away hundreds of homes in the eastern and western parts of the country, authorities there said. A $50 million rescue and rebuild mission is now underway to repair roads, bridges, schools, communication lines and provide health care to those affected. The country is in poor shape to withstand the financial impact of a disaster: Zimbabwe is in the grip of a deep economic crisis. The Zimbabwe Information Ministry shared pictures of some pupils who had been rescued from a boarding school in Chimanimani District, one of the worst affected areas in the east of the country. Bridges were swept away, and power and communication lines in the area have been cut off. This cyclone came after a week of heavy rains and flooding across southeast Africa that affected 1.5 million people in Mozambique and Malawi, killing at least 120 people in both countries, UN officials said. That rain was associated with the same storm system that later became Cyclone Idai.